What a way to start the year but to have one of the most successful game franchise, Grand Theft Auto available for download at the iTunes Apps Store? Yes, GTA fanboys, you read it right – Grand Theft Auto, specifically Chinatown Wars has arrived. It may be costly at $9.99, but hey if you’re a die-hard GTA fan, you won’t mind paying that much for an iPhone app, right? Ok, let me say a great iPhone game. Touch Arcade is saying that GTA: Chinatown Wars is like the the DS and PSP versions of the game franchise. Since I don’t have a Nintendo DS, I would have to agree that indeed GTA: Chinatown Wars for iPhone is similar to the PSP Grand Theft Auto game. Chinatown Wars gives you a complete GTA gaming experience. In fact, the game is so good that you won’t actually notice that you are actually playing the game on the diminutive screen of the iPhone. Everything about the game moves and loads fast. The graphics are pretty decent and definitely pushed the iPhone’s boundary to the limit. Chinatown War’s graphic is pretty impressive. Â The screen elements move fast whenever you are driving a car. The storyline is there, the house and garage which serve as your saving point and safehouse in other GTA games are also in Chinatown Wars. 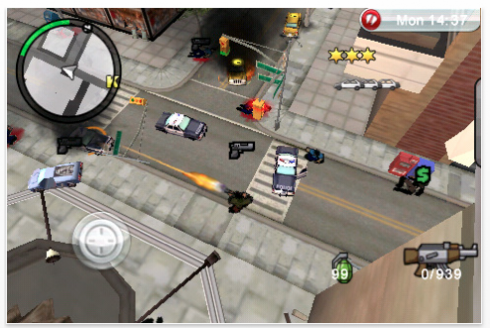 Grand Theft Auto: Chinatown Wars is a highly recommended iPhone game. The $10 that you will pay for it is definitely worth all the goodness you’re going to get Â while playing it. And did we say, fun as well? Hit on the iTunes link to get this app from the iTunes Apps Store. Introducing Vimeo Plus! from Vimeo Staff on Vimeo. If you’ve been paying attention to the videos that we usually embed to some of our news coverages here in 901am (I hope you’re watching these videos), you’ve probably noticed that aside from YouTube some of those came from Vimeo, a video uploading and sharing site similar to YouTube. If you’re a Vimeo user, specifically a paid Premium member, by the end of this month you can now start uploading full 1080p HD videos to Vimeo. Wait, just hold on a second. Wouldn’t that affect online playback of your videos? Especially since HD videos demand higher and faster bandwidth? Actually, yes it does affects online video playback. So Vimeo is giving you the option whether to choose sharing 1080p videos or stick with the current HD-quality 720p resolution. Vimeo is perhaps enabling this feature to answer the signs of the times since the influx of cheap portable videocam has made it easier to produce HD videos at 1080p resolution. And besides, YouTube has been Â allowing it for quite some time now. Â Since Vimeo is being touted as the best YouTube alternative, it is but logical for Vimeo to have that feature as well. Of course, this would also give Vimeo’s $60/year Premium package more attractive to users, since 1080 video uploading feature will only be enabled to paying members. In addition, Vimeo is also allowing premium account holders to make their uploaded videos available, downloadable and viewable on mobile phones. Â And pretty soon, a native Vimeo iPhone application will be available. So if you are not a Vimeo Premium account holder yet, now could be the best time to get the Vimeo Plus subscription. Video Hosting and Publishing is still a large growth sector. Vimeo is one of the major players that I’ve liked for a long time. They are getting ready to roll out some major new tools that will really help make their platform attractive to new users, and existing publishers. I don’t understand why other video hosting platforms namely YouTube doesn’t have a desktop application to allow you to upload videos straight from an application that you can control. Youtube doesn’t provide you with any stats other than what’s publicly available that’s one thing I’ve heard about Vimeo. Publishers like having control, and they like being able to view detailed statistics. People like BIG. Vimeo gets it on the Big Scale their videos are HUGE. 640×480 Gotta love that. Vimeo’s featured groups remind me of Flickr groups did before Yahoo bought them. Vimeo is smart, the groups brings community to the forefront and that’s where the important growth is.